When I was growing up, I apparently didn’t pay much attention when my Dad was showing me how to do stuff on my car. Now when I look under the hood for anything more than checking the oil, all I achieve is getting confused. I imagine that’s how a lot of people feel when they look at their competitor’s sites getting lots of Google love, while they’re stuck on page 4, 7 … 20. Especially when there’s articles floating around that say there are more than 200 factors Google takes into account when ranking sites. Well, yeah, there are. But for most search verticals there’s less than 10 that really count. But 10 is still a lot if you don’t know where to begin. If that’s you, then this video will point you in the right direction. In it I look at real sites to show you just why they’re highly visible in Google. How long it could take to see results from your SEO efforts. 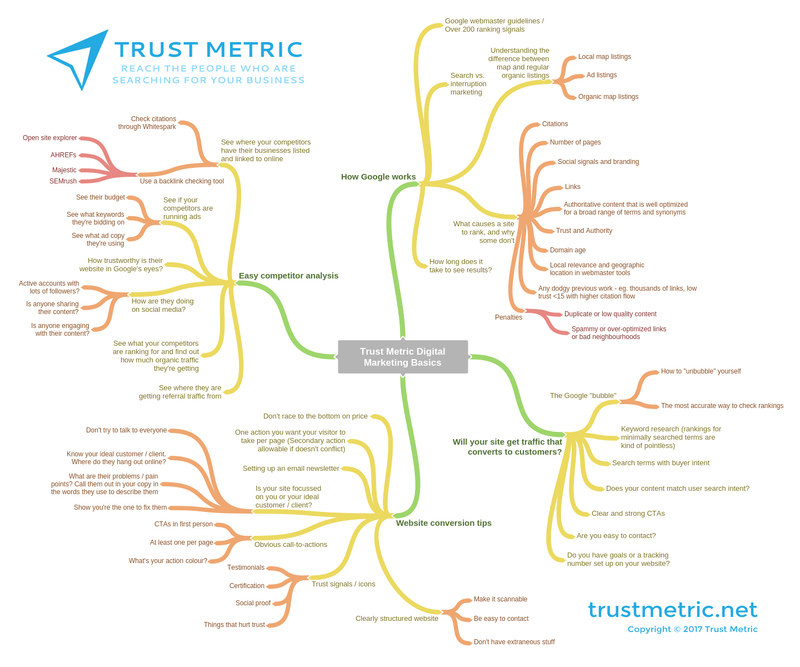 This video is one of a series of four Trust Metric digital marketing basics video walkthroughs. Pro tip: For a quick idea of any glaring issues with your site, you can run it through multiple free SEO site analysis tools, for instance this, this or this. While they won’t give you a thorough run down of everything that could be hurting your sites visibility and conversions (for that, check out our 70-point audit) they can help you see obvious mistakes or oversights that you might not have known to look for or resolve.